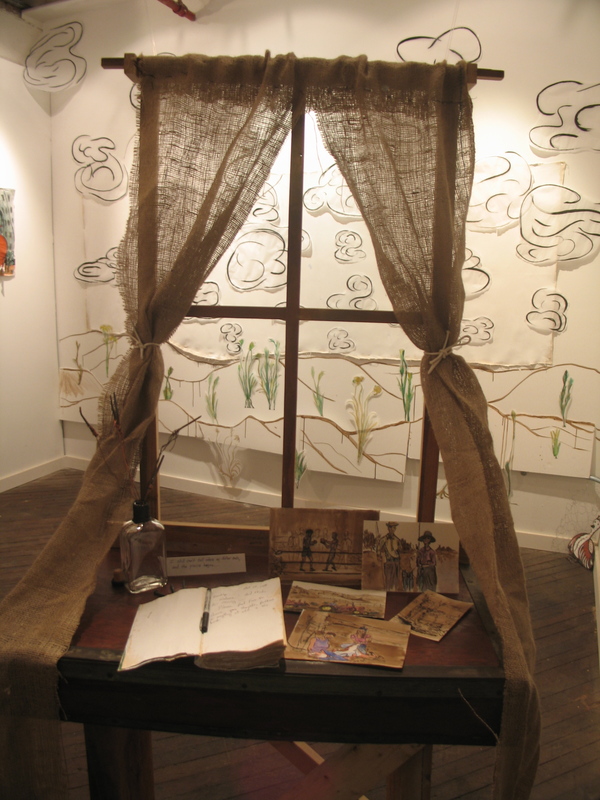 “I Still Can’t Tell Where My Mother Ends and the Prairie Begins. . .”; mixed media installation; 12′ x 9′ x 10′; 2008. This installation piece works with the idea of the landscape being at once in us and around us at all times, even if our view of it is at times limited through our means to see it. The title says it all on a personal level for me. She had an amazing connection to, and understanding of the natural world and our best means of connection was and still is through the land. On the table are several watercolors of old family photographs, a journal, a whiskey bottle vase of old hand made nails wrapped in copper wire. This internal scene suggests how the landscape also brings us closer to our inner world and forces us to reflect on our history.